International patients are presented general hospital services at Kadıköy Florence Nightingale Hospital, in 75 private patient rooms, all with Satellite TV, phone, private bathroom, nurse call system and room services for maximum patient comfort. 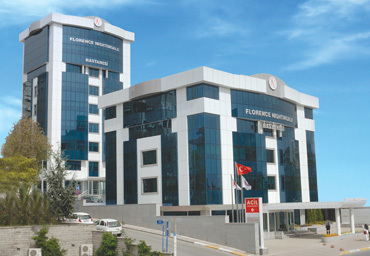 Kadikoy Florence Nightingale Hospital entered into service in 2007 in its modern building composed of 2 blocks, located at the heart of a fashionable residential and shopping area on the Asian side of Istanbul. The hospital provides international patients with services in all specialties with its inpatient and outpatient, diagnosis, fully-equipped Radiology and Angiography department, flat detector system, treatment and emergency service facilities and fully-equipped polyclinics. As in all Florence Nightingale Hospitals, theRadiology Department is able to shareall images simultaneously with the latest “picture archiving and communication system” (PACS) technology. Our fully equipped, state of the art meeting center also enables “telemedicine” – participation in international conferences and the hosting of satellite meetings via direct satellite connections – all for the benefit of our international patients. The Physical Therapy and Rehabilitation Center in the hospital provides effective treatment for diseases that affect people from all ages and cause loss of function and labour.